Stretching across Garfield County and Kane County in the southwestern section of the state of Utah, Bryce Canyon National Park is a stunning natural site that attracts millions of visitors each year. Despite its name, Bryce Canyon isn't technically a canyon but a group of natural amphitheaters on the side of the Paunsaugunt Plateau. Bryce Canyon is well-known for its hoodoos, thin towering rock formations formed by weathering and erosion over the years. Archaeologists have found traces of human habitation in the Bryce Canyon area going back thousands of years, with various Native American peoples and tribes inhabiting the area before European settlers arrived in the 18th century. Followers of the Mormon Church decided to settle in the area, with Ebenezer Bryce being the most notable. Bryce created his own little homestead in the canyon and built a road and canal. His work didn't go unnoticed and the canyon was named in his honor. In the years that followed, Bryce Canyon was given national monument status and became a popular tourist area, becoming a national park in 1928. Nowadays, the park attracts more than 2 million annual visitors and is home to a visitor center and bookstore, with a scenic drive route offering great views of key locations around the park. Other ways to tour the park and activities to enjoy around Bryce Canyon include horseback riding, hiking, and skiing. The red and white rocks of Bryce Canyon provide incredible views in every direction and the area is home to a wide variety of wildlife, including deer, foxes, badgers, snakes, lizards, black bears, bobcats, prairie dogs, dozens of species of birds, and more. Elevation is a key geographical term that denotes how high or low a location is in relation to sea level. It is often used when referring to towns or cities, but can also be an important factor when observing natural monuments like mountains and canyons too. Due to its multi-layered structure, Bryce Canyon's elevation can vary greatly from one point to the next, but even the lowest parts of the park are still situated at very high elevations. The elevation of Bryce Canyon leads to different temperatures in different parts of the park and results in different wildlife being spotted in each area. The highest point in the park, Rainbow Point, is situated at an elevation of 9,105 feet (2,775 m) and is located at the end of the Bryce Canyon scenic drive. The lowest point in all of Bryce Canyon is part of Yellow Creek in the northeastern section of the park, which sits at an elevation of 6,620 feet (2,020 m). This means that there's a difference of around 2,500 feet (762 m) between the park's highest and lowest points, so visitors can experience major elevations drops and gains during their trip to Bryce Canyon. The elevation of Bryce Canyon's rim ranges between 8,000 feet (2,400 m) and 9,000 feet (2,700 m). The elevation of Bryce Canyon has a huge effect on the park's ecology, with three distinct 'zones' being observed. The lowest elevation points of the park feature unique trees like pine and juniper, and many of the park's animals will migrate to these areas in winter due to the slightly warmer temperatures and more hospitable conditions. Mid-tier elevation areas in Bryce Canyon play home to spruce and Douglas fir trees, while the highest elevation points feature limber pine and bristlecone pine trees. It’s also important to note that the high elevation of Bryce Canyon can trigger altitude sickness in some visitors. The mean elevation of Utah is 6,100 feet (1,860 m), which is only lower than Colorado and Wyoming, meaning that Utah is the third highest state in America. 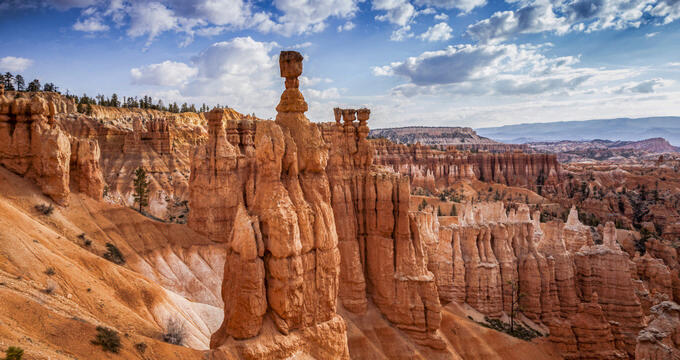 The elevation of Bryce Canyon is therefore above the state average. Even the lowest point of Bryce Canyon is higher than Utah’s average. The highest point in Utah is Kings Peak, one of the Uinta Mountains, which has an elevation of 13,534 feet (4,125 m), while the state’s lowest point is Beaver Dam Wash at the Utah-Arizona border with an elevation of 2,180 feet (664 m). The major cities of Utah include the state capital Salt Lake City, which has an elevation of 4,226 feet (1,288 m), West Valley City, which is situated at an elevation of 4,304 feet (1,312 m), Provo, which has an elevation of 4,551 feet (1,387 m), and West Jordan, which has an elevation of 4,373 feet (1,333 m).